That phrase, so deceptively simple, might be the only way to truly summarize the head-spinning, heart-stopping magic of vocal group, ViVA Trio, in full flight. 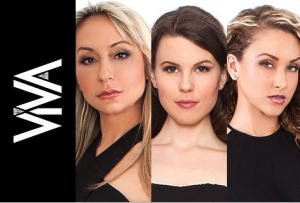 When it’s declared by soprano Anna Bateman on behalf of cohorts, mezzo-soprano Erin Fisher and soprano/songwriter Katya Tchoubar to describe ViVA’s musical essence, it scans as exactly right. Really, how else to convey what this group of superbly talented singers with their angelic/athletic voices are doing with the contemporary pop/rock songbook, recasting hits like Duran Duran’s “Ordinary World,” Sia’s “Space Between” and “Bird Set Free,” John Lennon’s “Imagine,” Chris Isaak’s “Wicked Game,” Leonard Cohen’s “Hallelujah” and — wait for it — Metallica’s “Nothing Else Matters” as thrillingly accessible operatic and cinematic gems? Indeed, ViVA Trio’s dazzling debut, Nothing Else Matters, which includes the before-mentioned songs plus two ViVA originals and readings of Evanescence’s “My Immortal” and Louis Armstrong’s “What A Wonderful Word” (already an international smash for the three; more on that later) expertly converges classical and contemporary, blazing a vibrant new crossover trail previously tread by acts like Il Divo and 2CELLOS, albeit more glamorously. ViVA is a vocal group expanding the boundaries of classical crossover music. Comprised of three sopranos, Anna, Erin and Katya. This all-female group’s music and sound is inspired by fellow crossover artists such as Il Divo, 2CELLOS and Evanescence. The ladies of ViVA have been trained and educated at top music institutions: The Toronto Royal Conservatory of Music, University of Toronto, and University of British Columbia. They have each performed individually in acclaimed opera and concert hall stages such as the Canadian Opera Company, The Orpheum in Vancouver, Toronto Operetta Theatre, The Rudolphinum in Prague, Aldeburgh Music Festival in the UK, and New York’s Chautauqua Festival. Their live performances feature up to two hours of classical and crossover repertoire. At a ViVA concert, at Casa Loma, Toronto, the ladies serenaded an audience of over 1000 people and were featured on Toronto’s CityTV CityNews. Recently, they performed with the CSO to a sold-out crowd at the Living Arts Centre of over 1000 people, and at The Christian Arts Performing Centre to an audience of 1500.